Power and its Minions: Is Scottish Unionism Treachery? Treachery has been a reviled and despised quality as long as history and literature have been recorded. In his Inferno, Dante went so far as to reserve the ninth and lowest circle of Hell for traitors. The question is: is the language of treason entirely appropriate in a supposedly healthy debate on Scottish independence, considering that the Scots in the Labour Party are not technically betraying their own country by opposing Scottish nationalism? Nationalists may argue that it is their own people and the nation of Scotland they are betraying, but to the paid-up Labour Unionist, his or her country is the United Kingdom. What about ‘Vichy’ and ‘Quisling’? Are these charges too strong, considering Scotland is not yet an independent country, and not at war? In the online forums of the press, we often hear these words leveled against Labour politicians – those who would aid and abet London’s continuing colonial control of Scotland for their own personal gain. Personally, I consider Scotland’s SUKCUP press fair game. But do these words alienate undecided voters, rather than persuade? How much does this level of invective hinder rather than help the cause of Scottish independence? To help answer these questions, I thought it would be useful to summarize the different forms of traitorous accusation, putting them in their original historical context, to determine if indeed they are appropriate to Scotland today, or simply over the top. 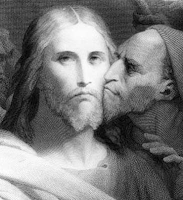 Judas Iscariot betrayed Jesus to the Romans soldiers for thirty pieces of silver by identifying him with a kiss. He died alone, probably by hanging himself. Not particularly relevant to Scotland, since Unionists are quite open in their allegiances. They do not see themselves as traitors to a country which they deny even exists. In the same vein, Judas betrayed a friend, whereas Unionists are utterly loyal to their London masters. They may be servile colonial lickspittles in the eyes of nationalists, but they are not betraying any friendships by their actions. American Colonial War of Independence (I refuse to call it a revolution). Arnold was a successful general in Washington’s army who switched sides. Still regarded in American history as the embodiment of treachery. Even though he lived out the rest of his life in Britain, he was never entirely trusted by anyone. He had, after all, fought on the other side first. A reformed rebel is still a rebel. And the reason he switched sides? Wait for it…he had been passed over for promotion and ordered to repay expenses. Spanish civil war. Not strictly traitors (although they were opposing the elected government in a civil war) but rather an enemy within. In 1936, as four columns of Franco’s fascists approached Madrid, Fascist radio claimed that a ‘fifth column’ of supporters inside the city would help them take it. The campaign failed, and the Spanish government forces held off Franco for three more long years. The term gained currency during WW2 in relation to the Germans living in Britain. Fearing a ‘fifth column’ within, Churchill gave his famous ‘collar the lot’ command and they were rounded up and held on the Isle of Man until the end of the war. The term is often used in Israeli press today to describe Israeli Arabs, whose loyalties lie with the Arabs in the occupied territories. Norway’s greatest ever traitior, Vidkun Quisling, led the Norwegian Nazi Party, and was set up by Germany as Norway’s puppet leader during their occupation. His fate? To be found guilty of high treason and shot as a traitor after the war. His greatest grammatical achievement was to be both nouned and verbed. One can be a Quisling, or one can quisle. This is a verb that should be revived. Incidentally, ‘Quisling’ sounds a lot like usling in Norwegian – a slippery, deceitful, slimy person. Also from the Second World War. Still a sore point in French history, and one that excites much scholarly debate. After surrendering in 1940, France agreed to become a client state of Nazi Germany and the central and southern region was left to run its own affairs, unoccupied by German troops, run from the small spa town of Vichy. De Gaulle tried to rally the Resistance from London, but the indisputable fact is that many French collaborated with the Nazis. I got an interesting take on this from one of my French amis: if France had fought tooth and nail for every centimeter of la patrie, all those pretty French villages that we love to visit on our driving holidays would have been destroyed. He believes that surrender was the best policy at the time to save France’s architecture and culture, given the overwhelming odds stacked against it. Cheese eating surrender monkeys, or the pragmatic rationalizers of the military reality at the time? From a nationalist perspective, the fifth column idea of an enemy within seems most relevant to the role Unionists play in maintaining Scotland’s position within the Union, but since the relations between Scotland and the rest of the UK are peaceful, it is still too strong. Indeed, none of these terms would therefore seem suitable for the debate on Scotland’s independence, considering (1) Unionists happen to believe in a different identity, and do not see themselves as traitors, and (2) there is no secessionist war between Scotland and the UK. That is why I believe that the most appropriate historical equivalent for our Scottish Unionists friends – be they Scots in the Scottish Office, members of the UK government, or Unionists employed by the Scottish TV and print media to talk down Scotland – is that of a besieged colonial elite in its last days of colonial rule. No colonial power in history ever ruled without the help of a local elite in the subjugation of its own people. The key to understanding their essential bridging function is that the colonial power cannot do it without them, and that once the colonial relationship is over, they are without exception despised by all sides – by both their own people and by the ex-governing power. They are usually remembered by the ex-colonial power as failed flunkies, and by the newly independent country as former collaborators in their own people’s subjugation. For these reasons, this is the group that always fights hardest for the colonial arrangement and their colonial privileges to continue: they know full well that once independent comes, the game is up. They will become pariahs, despised by all, with no part to play in either the new domestic political scene or in future diplomatic relations between the ex-imperial power and its newly independent former colony. In summary: useless, washed up, redundant. If there is a violent transition to independence (as there was for the United States, Ireland, Algeria and Kenya) they tend to die either at the hands of their countrymen, or like Benedict Arnold in exile as old men in the imperial homeland, trusted by no one, hated by their countrymen from a distance, passing away in obscurity and exile as bitter, friendless, alcoholics, ‘unwept, unhonoured and unsung’. If on the other hand the transition is peaceful (as it was for Australia, Canada and New Zealand, and as it will be for Scotland) former Unionists can quickly become absorbed into the political structure of the newly independent country and play their part. The challenge in forming new states is in incorporating all the former factions into the newly independent political spectrum. They are usually intelligent men and women who have much to offer a fledgling nation. Whether or not they choose to depends a lot on the level of rhetoric used against them in the run up to independence. It also depends on whether the newly independent nation can ever bring itself to trust them, based on how vehemently they opposed independence as Unionists in the colonial regime. Unionists by and large are loyal to the UK - and that includes Scotland. When they betray Scotland in favour of English supremacy then they become traitors to Scotland - as in the suppression of the McCrone report. When they implement a policy of mass immigration as a means of retaining power then that is a betrayal of all the peoples of the UK. When they sign a treaty that they had promised a referendum on, that subordinates the will of the British peoples to that of a transnational elite, that is treachery. So where's the lamp post and who brought the piano wire? I don't go near lamp posts since Brown had all the mics installed. Yet another well written and well put forward opinion. You have made me think again. I am with scunnert on this one ,supression of info is a Fifth colum issue, Quisling is another valide title in my opinon but I agree a Unionist would not think so. Vichy also has some comparisons with Scottish labour. But these are matters of degrees and I agree with you on the post independance issue. Old unionists could be a valuable resourse..but beware of Benndict Arnolds and a Fifth colum post independence,a lot of Unionists would love to see an Independant Scotland fail. "a lot of Unionists would love to see an Independant Scotland fail." I agree. Even though they may live to see the first fifty years of an independent Scotland, died-in-the-wool Unionistas will still be plotting its downfall. Every success it has will be met with derision, bile and hate. Then some of the terms above will certainly apply. I live for the day when I see Murphy's head in a noose with his toungue sticking horribly out! See, that is what I am talking about, DL! He should be mocked, not threatened. And it is no easy to do - there is so much material. Come the glorious day, he will be irrelevant. I was hoping you would blog about Sir Alex Ferguson's support for Willie Bain in Glasgow North East. I assume that because cybernats "attacking" unionist celebrities for supporting Labour makes them "morons" that you think Alex is great. Muriel and Alex are "socialist" millionaires who despise the SNP but no-one according to you is allowed to criticise them? As far as I am concerned, by backing Bain, Ferguson has put his head over the parapet and is now a political figure. He therefore deserves to be attacked for intervening in a political event, for supporting a supposedly socialist party from his position of wealth, and for looking after his own interests, ie, that of a prominent Scot working in England. He is also betraying his roots, and admits he is commenting on Glasgow’s situation based on occasional visits. All easy stuff to counter. The question is the language used. Do Ferguson’s comments amount to treachery? Is Ferguson a quisling piece of fifth column filth who deserves to be strung up from the nearest lamppost? Do you think attacks like that will persuade him and others like him, or just make us look like fanatical nutters? Or is Ferguson simply misinformed and exhibiting poor judgment for allowing himself to be used? Is his opinion based on mis-information, something that can be fixed by inviting him to see the places he is talking about? To go to the parts of Glasgow that Labour have run down and turned into havens of benefit dependency? There are only five million of us. We need to get a majority to get this referendum over the line and start fixing what’s wrong with our country. What do you propose we do with Scots who disagree with that idea? Shoot them? How do you propose we set about nation building if we all hate each other’s guts by the time we achieve independence?